Eduardo Quintero lives in Sincelejo, Colombia, with his wife and their two young children. Eduardo works with his wife in the city market wholesaling tubers like potatoes, “arracacha,” and yucca. For several years, Eduardo had to face a very difficult economic situation; he had to carry loads in the market during long shifts for weeks on end with a few or no days off. Saving little by little he was able to surmount these challenges and pay the first installment of a house and invest a modest amount to start a business. Eduardo joined Opportunity through a loan officer who visited the market. Eduardo discussed with the loan officer the right amount to borrow and he saw that used wisely, a loan could boost his business. 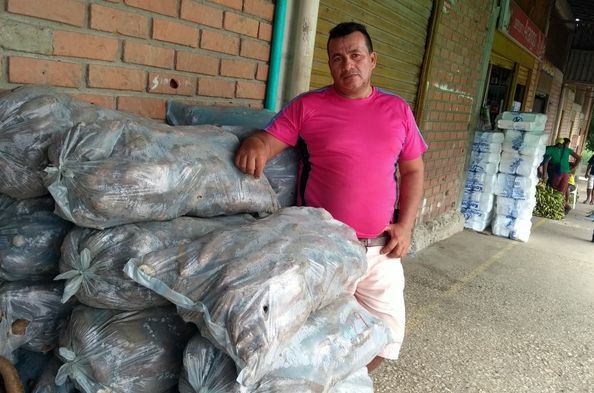 Eduardo used his loan to buy directly from the people who harvested the tubers and soon his business was stronger and he started distributing to other businesses. His income and life quality improved considerably and he has been able to accomplish dreams that previously seemed impossible, like going on a family vacation. Eduardo is still working very hard, and he now has confidence in the future of his business and of his family, which makes him work with more love and passion every day.